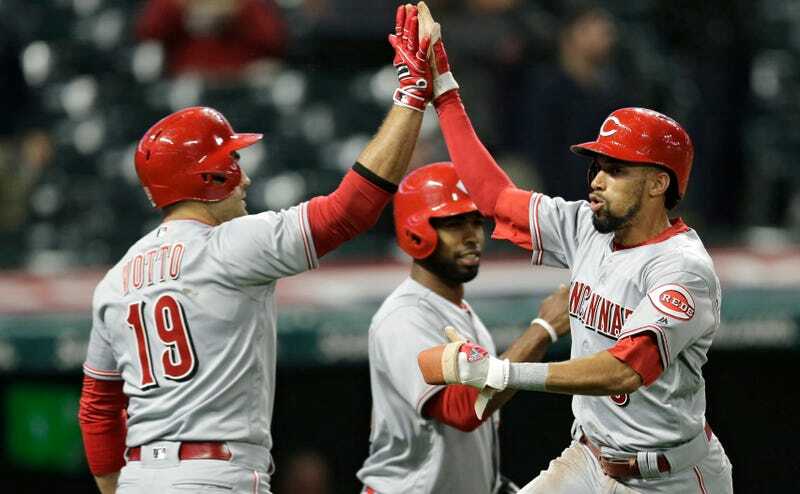 On consecutive basepath sprints, Billy Hamilton kept the Reds alive and then scored the winning run in a Reds 4-3 victory over Cleveland, and they were both dashes that no other major leaguer besides Hamilton could’ve accomplished. Speed is indeed a weapon, and it’s pretty fun to watch. Cincinnati was down a run with men on first and second in the ninth when Hamilton grounded sharply to first. The Indians tried to turn a double play, and Hamilton was called out at first, and the stadium fireworks went off—but Bryan Price came out to challenge the call, and upon review Hamilton was indeed safe, by the slimmest of margins. Hamilton was running on the pitch when the next batter, Zack Cozart, lined a ball to left. Michael Brantley dove, missed, took a second to locate the ball, and Hamilton went first-to-home on the single. Even knowing that, when you watch the video I think you’ll be shocked at how early in the runtime the startled play-by-play guy realizes Hamilton is coming home and scoring without a challenge. For the Indians, it was Allen’s first blown save since last August. He thought he had this one nailed down, but a lot of teams think they’ve nailed Billy Hamilton, and haven’t.